SKATE LIKE A GIRL - Everybody Skates! WHEELS OF FORTUNE 10 IS COMING! WOF is coming... are you? The 10th Annual Skate Like a Girl Wheels of Fortune Weekend is back May 3-5th in Seattle! In its tenth year, WOF is the longest running and largest skateboard showcase featuring women, trans, and gender non-conforming skaters of all ages and abilities from around the world. This weekend long event culminates with a showcase featuring local and international skaters from 10+ countries. All are welcome to watch this fun and free event. Grab your crew, get your plane tickets, & let’s do this! Will you be our new volunteer? Skate Like a Girl is a nonprofit organization that empowers individuals, especially young womxn, to become strong, confident leaders who promote and implement equity through the vehicle of skateboarding. We believe that skateboarding is a tool to build confidence, resilience, and foster inclusive community. These goals are captured in our vision, mission, and values. Learn to shred! Join us for structured, inclusive, and supportive group skateboarding classes - includes all gear! Rate: $89 for 4 week session (pre-registration required). $25 for a single drop-in session (no pre-registration required). Our diverse and dedicated counselors are pumped to get your young ripper rolling with the basics, or take their existing skills to new heights! Along the way, we'll make new friends, learn life skills such as self-confidence and determination, and work together to make skateboarding more inclusive for all! All gear (helmet/pads/skateboard) included. All campers receive a camp t-shirt. All abilities welcome. Partial & full scholarships are available. "I was really impressed with the counselors in terms of their support and their focus on the kids safety at all times. Awesome camp, great people, very kind, supportive and inclusive. 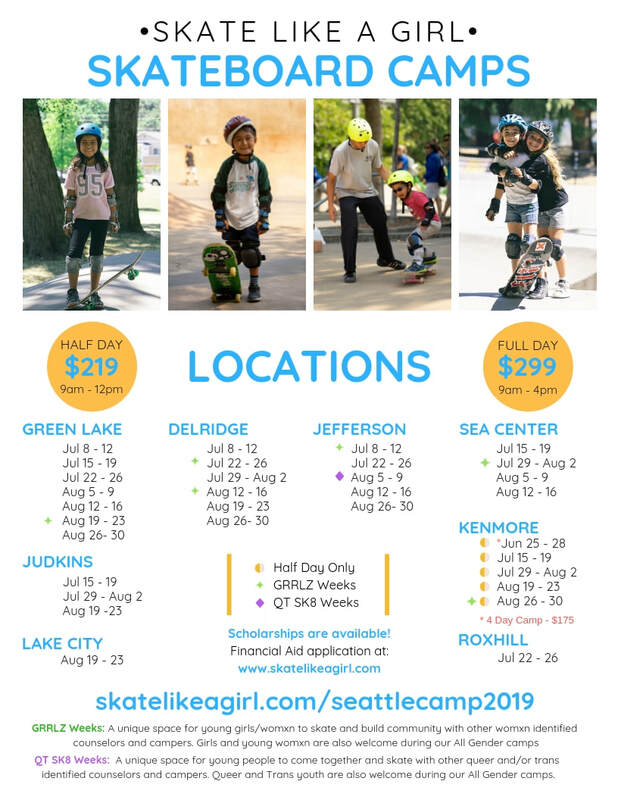 My kids really enjoyed their time there" - Rivelea C.
All Hands On Deck is our annual fundraising campaign which supports accessible skateboarding programs for youth across Seattle, Portland, and the SF Bay Area! Each donation helps our organization further provide skateboards and pads as well as free and low-cost programming to youth throughout our chapters as well as expand our reach.